Full of Grace and Truth: "For what reason were the martyrs tormented?" 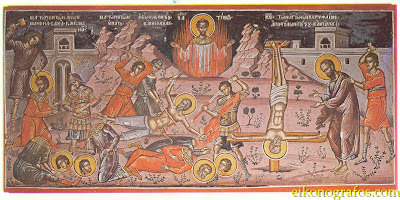 This is an icon of the martyrdoms of numerous Holy Saints, including Sts. Peter and Paul (all the way to the right), Sts. Manuel, Sabel and Ishmael, Sts. Leontios, Ypatios and Theodoulos and St. Timon. (The rest going left to right). 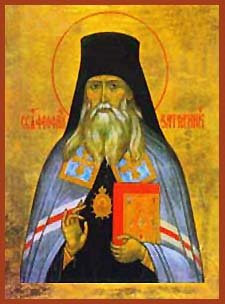 The Icon is courtesy of www.eikonografos.com used with permission. "For what reason were the martyrs tormented? Because, having believed in the Lord and having been united with Him, they did not want to worship false gods. The false gods were the spirits of passions and evil deeds. For he who refuses to give in to passions does the same as he who refuses to bow down and worship idols."